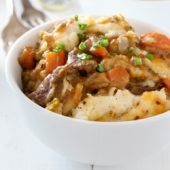 Hearty Guinness shepherd's pie, packed full of tender beef and vegetables. A flavorful meal for St. Patrick's day celebrations or any day! Prepare vegetables. Trim meat of fat and cut into 1-inch pieces. Lightly sprinkle meat with salt and pepper. Heat butter or olive oil in a 10-12 inch skillet or large Dutch oven over medium-high heat. Brown meat in batches, flipping once. Transfer meat to a clean bowl or large plate. Reduce heat to medium. Add onion, celery and carrots, cooking until onions are translucent. Add minced garlic, cooking for an additional minute. Sprinkle with salt, pepper and thyme. Stir in tomato paste and steak sauce. Return meat to pan along with peas. Whisk together flour and beef broth until smooth and fully combined. Carefully pour beef broth and Guinness into hot pan, stir to combine. Mixture will begin to thicken. Transfer mixture to the preheated oven, cooking covered for 60 minutes. Toss gently after 30 minutes. If making ahead, cool beef mixture completely. Store in the refrigerator until ready to proceed. If continuing with recipe immediately, begin cooking potatoes 30 minutes before beef mixture is ready. Season potatoes with butter, cream, salt and pepper to your liking. Stir half of the cheese into the mashed potatoes. Top off beef mixture with mashed potatoes. Sprinkle with remaining shredded cheese. Cook for an additional 30-40 minutes. If desired, broil or use a kitchen torch to lightly char the cheese. Sprinkle with chives. *roughly 1lb russet potatoes should be used for mashed potatoes. Season with butter, cream, salt and pepper to your liking.